The Blot Says...: SDCC 2018 Exclusive The Great Showdowns Pop Culture Prints by Scott C.
SDCC 2018 Exclusive The Great Showdowns Pop Culture Prints by Scott C.
Scott C. will be setting up shop once again at Gallery Nucleus’ SDCC booth #2643 where he will be debuting a ton of epic pop culture inspired The Great Showdowns prints! There will be a new San Diego Comic-Con 2018 Exclusive The Great Showdowns print released each day: Wednesday Preview Night is the V for Vendetta print “Mask and Knives, Thursday is the Book of Life print “The Rose”, Friday is the Black Panther print “Kings, Saturday is the Princess Mononoke print “Princess” and Sunday is the Doctor Strange print “The Doctor”. 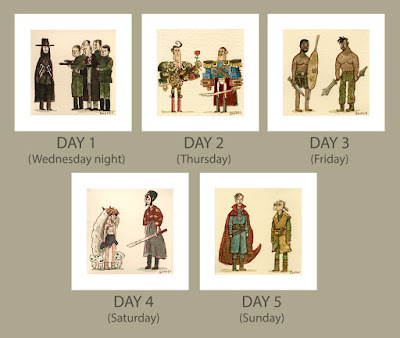 Each San Diego Comic-Con 2018 Exclusive The Great Showdowns signed and numbered print measures 4.75”x4.75”, is limited to 75 pieces, and retails for $15. Only 40 pieces of each print will be available for purchase at SDCC, with the remaining pieces available at the Scott C. online store after the convention.